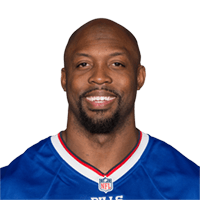 Published: Jan. 3, 2016 at 04:04 p.m.
Bills Manny Lawson intercepts Jets Ryan Fitzpatrick on a pass intended for Brandon Marshall. Published: Nov. 24, 2014 at 09:09 p.m.
Buffalo Bills defensive end Manny Lawson recovers a blocked punt in the end zone for a touchdown. Published: Aug. 8, 2014 at 10:44 p.m.
Buffalo Bills defensive end Jarius Wynn manages to strip the ball from Carolina Panthers quarterback Matt Blanchard, and defensive end Manny Lawson recovers the fumble. Published: Dec. 30, 2013 at 06:12 a.m.
(5:08) (Shotgun) T.Brady pass intended for S.Vereen INTERCEPTED by M.Lawson at BUF 48. M.Lawson to BUF 48 for no gain (M.Cannon).